Stimulite Contoured Cushion, manufactured by Supracor, provides higher levels of pressure management. More specifically, the Stimulite Contoured Cushion features a 3.5-inch thick cushion that consists of multiple layers of malleable, Stimulite honeycomb to provide relief from pressure sores. 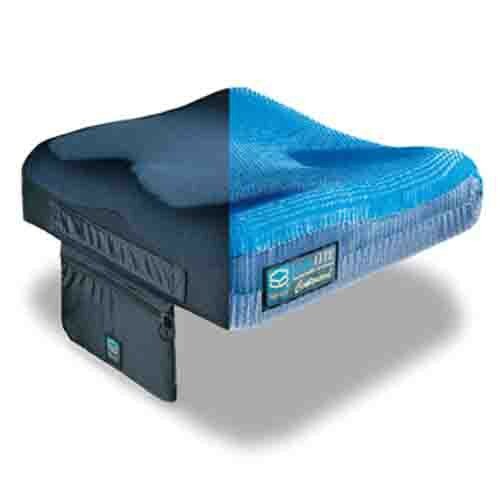 In addition to the foam conforming to each user's anatomy, this Supracor seat cushion is specifically engineered with soft and firm locations. In fact, this seat cushion features what Supracor calls a "sweet spot," a delicate, yet pliable area that cradles the ischial bones and coccyx, providing excellent pelvic positioning for enhanced posture and balance. To enhance user comfort, the Stimulite Contoured Cushion presents adductors and an abductor to comfortably and snugly contain the lower extremities, without hindering patient transfers. Comfort and positioning, though, is merely one facet of this Supracor cushion. Supracor designs the Stimulite Contoured Cushion to be machine washable, too. This Stimulite seat cushion is readily available in different sizes to accommodate specific and unique needs. To effectively mitigate discomfort and prevent pressure sores, order this durable, yet comfortable and supportive cushion today! Product Numbers: CD1416, CD1616, CD1618, CD1816, CD1818, CD1820, CD2016, CD2018, CD2020.